Mom was shopping at the Lighthouse Mall at Michigan City just five blocks from the beach when she heard the sirens. She thought, “I hope there hasn’t been a serious car accident.” Little did she know that she was hearing the search and rescue units that had been dispatched to the lake to search for her seven-year-old son, Carl. She finished her shopping and headed for the waterfront to meet her husband John and their four boys. When she arrived, she saw her oldest son Curtis running in the parking lot. He rushed to her and blurted out the grim news: Carl was missing! In the tumult and confusion of that frightful scene, she saw the search helicopter in the sky and the police cars around her. That sickening moment was the beginning of a long and difficult wait for the recovery of the body of John and Jeanie’s precious son. Carl and Cris had been playing on the pier about 150 yards from where their brothers Curt and Chad were fishing with their father. The waves were high, but the pier was higher; surely they would be safe! But Carl, against the warning of his older brother Cris, decided to explore the lower level. Shortly after Carl climbed down, he was swept off the rocks by a giant wave, and torn from the frantic grasp of his terrified brother who had jumped in to rescue him. Thankfully, a bystander pulled Cris from the water. But Carl had already disappeared. In a brief instant, he was gone. In spite of the efforts of twenty-five divers and the use of a submarine and a helicopter, Carl’s body was not found until six days later; and then, it was located over 40 miles from where he had drowned. His brothers soon learned that every story does not have a happy ending like many episodes on TV. Why does God allow such tragedy? Why would He allow this to happen to a sparkly, blue-eyed boy that loved to fish with his dad and fold clothes with his mom? The Lord Jesus was able to stop the storm for His twelve disciples two thousand years ago; why couldn’t He save Carl for three heart-sick brothers and a grief-stricken mom and dad? We don’t have all the answers, but we know the Lord Who does–and we can trust Him, even when we do not understand. Carl’s family learned many important lessons because of their terrible loss. Mom and Dad gained new insight about God giving His Son, Jesus to die for us. They lost one of four sons; God gave his only Son. What a sacrifice that must have been! They saw how difficult it was to have patience in waiting for the recovery of Carl’s body. They likened it to suffering saints waiting for Jesus to come again. Oh, how we should be anxious in our anticipation of His coming! The whole family can see that the Lord took Carl–but left Cris. They understand that God has a purpose for Cris (and for all of us who remain on this earth). They recognize that it is our responsibility not only to discern God’s purpose for our lives, but to fulfill it. They now comprehend in a deeper and fuller way that time is short and eternity is long. They treasure those things that really matter in this life. And Heaven is sweeter to them–because Carl is there. What a wonderful reunion that will be someday! Perhaps part of the reason that the Lord allowed Carl to be taken to Heaven is because He knew that you would be reading this story today. He wanted to get your attention. He wanted you to know what Carl knew—He wanted you to know the way to Heaven. Carl had trusted Jesus as his Savior; and you can trust the Lord Jesus also. Here’s how. C—CALL on the Lord to save you. Simply talk to Him. Tell Him you are a helpless sinner, and that you realize that only He can save you; then ask Him to do just that! Ask Him to save you. He promises that He will. He said, “Him that cometh to me I will in no wise cast out.” (John 6:37) He will receive you when you come to Him in prayer. Will you take Him at His Word and come to Him right now? Carl did, and you can too. Why not talk to the Lord today? Don’t wait. He does not promise you a tomorrow. Get alone with the Lord and settle the matter forever! Carl’s death reminds us of the special, loving methods that the shepherds in the Swiss Alps have with their sheep. In the summertime when the grass in the lower valleys withers, a shepherd leads his flock to higher grazing lands where the grass is still green. Often the winding paths to the higher lands are thorny, steep, and dangerous. When the frightened sheep do not want to go, the shepherd reaches into the flock and takes two lambs. He carries one under each arm as he starts up the hazardous path. Even though the way is narrow and frightful, the ewes start to follow. Then the whole flock starts up the path that leads to a better place, and they are safe with their shepherd. 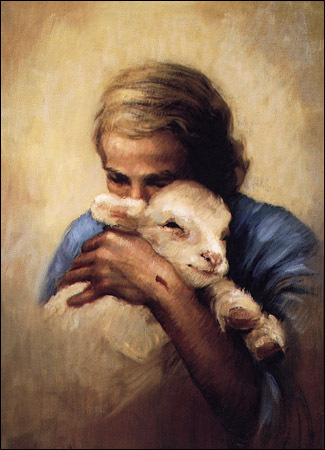 On July 1, 1995, the Lord (our Great Shepherd) reached down into our flock and took a lamb. Carl is now in Heaven. The Lord did not intend to rob us; He wanted to direct our attention to things that really matter. He wanted to lead us to a better place. Will you follow the Shepherd? Trust Him today as your personal Savior. You will be glad that you did!